Over the past few days there has been a lot of talk about the Paris climate agreement, from which the United States is planning to withdraw. 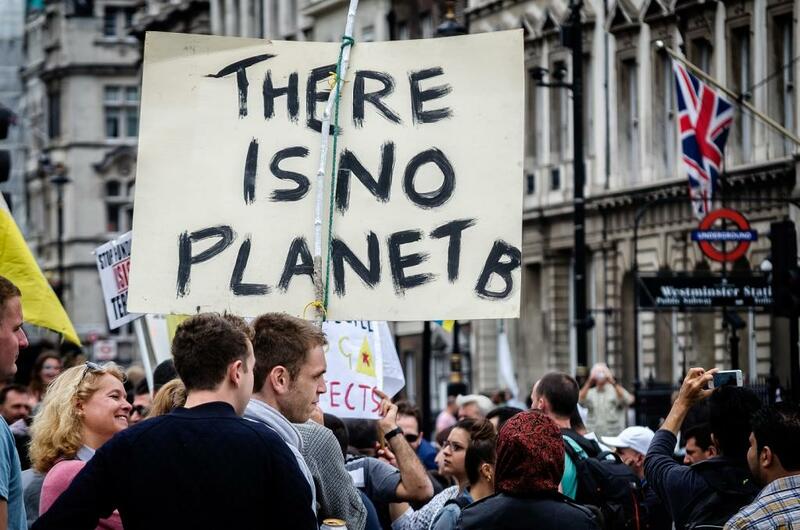 Although this is a setback, there is still near-complete consensus from the world’s governments that a strong effort to tackle climate change is needed. But this begs the question: what are “pre-industrial levels”? Clearly, if we’re aiming to limit global warming to 1.5℃ or 2℃ above a certain point, we need a common understanding of what we’re working from. But the Paris Agreement doesn’t provide a definition. This becomes key as governments expect climate scientists to coherently compare different plans to reach their Paris targets. It’s crucial to be clear on what researchers mean when we say “pre-industrial”, and what assumptions our projections are based on. 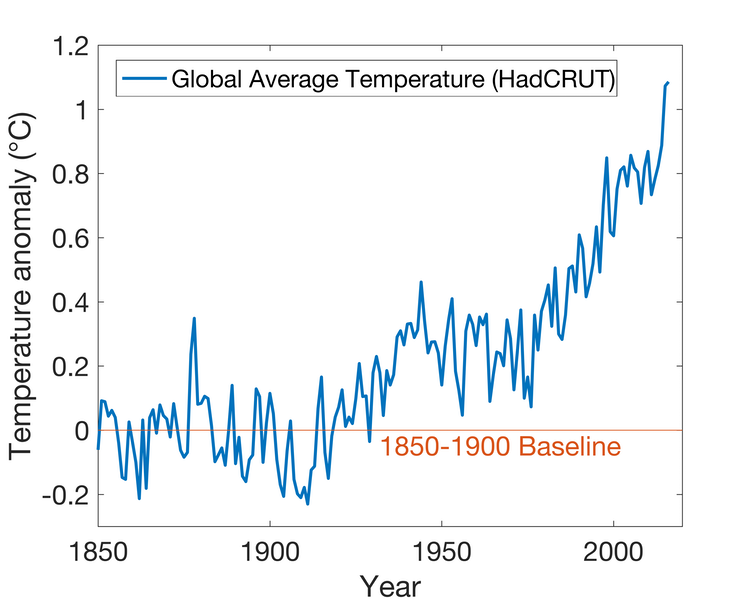 Of course, as the chart below shows, no matter which baseline we use it’s clear there’s been a drastic rise in global temperature over the last century. The Industrial Revolution began in the late 1700s in Britain, and spread around the world. But this only marked the beginning of a gradual rise in our greenhouse gas emissions. 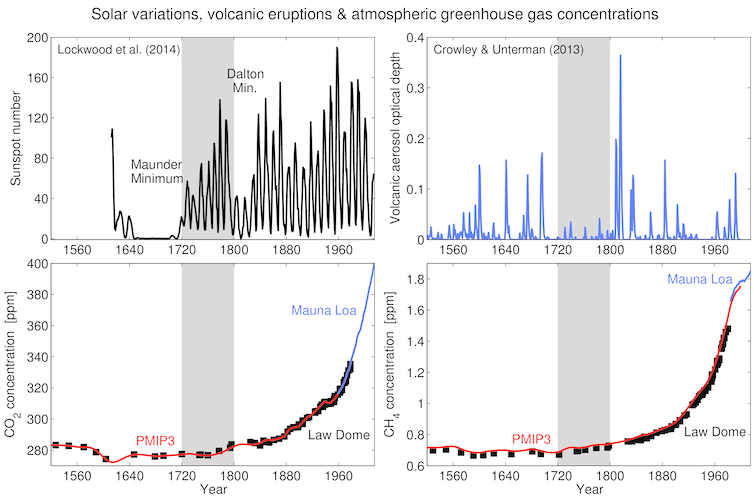 Various studies have found climate change signals appearing on a global scale as early as the 1830s, or as recently as the 1930s. Besides the evolving and increasing human influence on the climate, we also know that plenty of other natural factors can affect Earth’s temperature. This natural variability in the climate makes it harder to determine a single precise pre-industrial baseline. Scientists separate these natural influences on the climate into two groups: internal and external forcings. Internal forcings transfer heat between different parts of Earth’s climate system. The El Niño-Southern Oscillation, for example, moves heat between the atmosphere and the ocean, causing year-to-year variations in global average surface temperatures of about 0.2℃. Similar variations also happen on decadal timescales, which are associated with slower energy transfers and longer variations in Earth’s temperature. External forcings come from outside Earth’s climate system to influence global temperature. One example of an external forcing is volcanic eruptions, which send particles into the upper atmosphere. This prevents energy from the Sun reaching Earth’s surface, and leads to a temporary cooling. Another external influence on Earth’s climate is the variability in the amount of energy the Sun emits. The Sun’s total energy output varies on multiple cycles and is related to the number of sunspots, with slightly higher temperatures when there are more sunspots, and vice versa. Earth has experienced extended periods of cooling due to more frequent explosive volcanic eruptions and periods of few sunspots – such as during the “Little Ice Age” which lasted roughly from 1300 to the 1800s. There is high variability in the solar and volcanic influences on the climate (top row) while greenhouse gas influences rise over time (bottom row). A suggested 1720-1800 baseline is highlighted in grey. Adapted from Hawkins et al. (2017). All of these factors mean that Earth’s climate can vary quite substantially even without human interference. It also means that if we choose a pre-industrial baseline when there was low solar activity, like the late 1600s, or in a period of high volcanic activity, like the 1810s or the 1880s, then we would have a lower reference point and we would pass through 1.5℃ or 2℃ sooner. At the moment there is a drive among the climate science community to better understand the impacts of 1.5℃ of global warming. The Intergovernmental Panel on Climate Change will deliver a special report on 1.5℃ next year. But scientists are defining “pre-industrial” or “natural” climate in different ways. Some work from the beginning of global temperature records in the late 19th century, while others use climate model simulations that exclude human influences over a more recent period. One recent study suggested that the best baseline might be 1720-1800. These different definitions make it harder to synthesise the results from individual studies, which is vital to informing decision-making. This will have to be a consideration in the writing of the IPCC’s report, as policymakers will need to easily compare impacts at different levels of global warming. There is no definitive way to determine the best “pre-industrial” reference point. An alternative might be to avoid the pre-industrial baseline altogether, and instead set targets from more recent periods, when we have a better grasp of what the global climate looked like. You can read more about defining a pre-industrial climate here and here.